Looking for something to do over the Weekend, I was drawn to the Grand Opening of a new food truck park, Dallas’ first, The Cedars Food Truck Park, down in the Dallas Heritage Village on the south side of downtown. I rode the DART train to the Cedars Station and walked across the no man’s land south of downtown to the park. 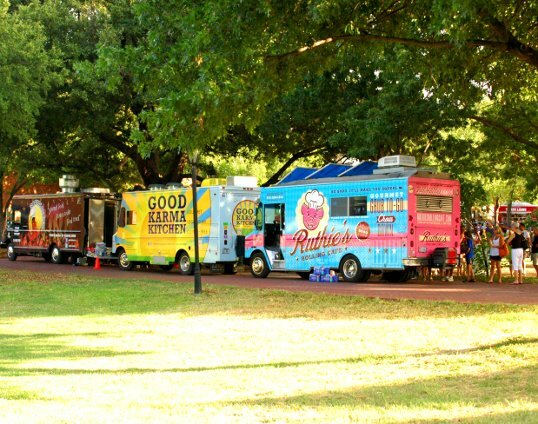 Most of the food trucks were in a big arc around the open grounds. A lot of trucks and a wide variety of food. 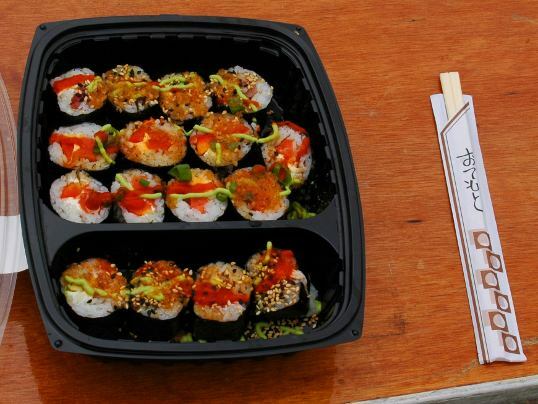 Since I was there early and it was still scorching hot – the lines were non-existent and I chose some sushi from Crazy Fish. Music was provided by a three piece mountain-folk group, The Sicklies – that I know nothing about but will see again if I have the chance. 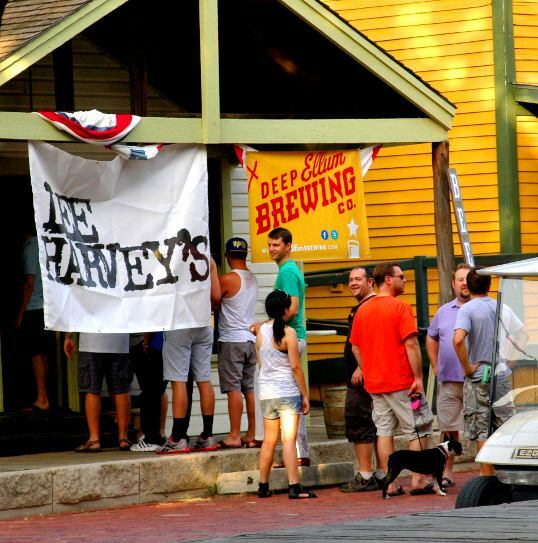 Liquid refreshments were provided by the folks from the nearby bar/club Lee Harvey’s – serving up some beer from the Deep Ellum Brewing Company. Their stout was as excellent a dark beer as I have had in a long time – really good stuff. Beer from The Deep Ellum Brewing Company, served up by the folks from Lee Harvey’s. The beer lines were plenty long – a lot of thirsty folk. The whole evening was a blast. As the evening grew long and the air grew cooler the crowd grew until there were long lines at the food trucks and even longer ones for the beer. I didn’t stay too late – I didn’t want to make the walk back to the DART station in the pitch of night. Sometimes the big city shows you its good side – it did tonight. I’m not sure if it was the presence of all the old historic buildings, the comradeship of the past, or if it was simply a well-planned event, but everyone was smiling and talking to each other. A happy time… with food, and very good beer. 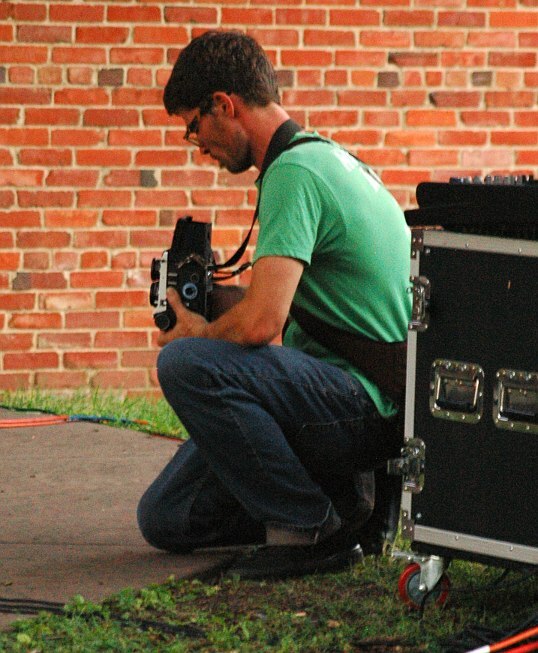 A photographer – You don’t see these cameras very often any more. Shame, really. I have been trying hard to watch what I eat recently… and doing a fairly good job of it. 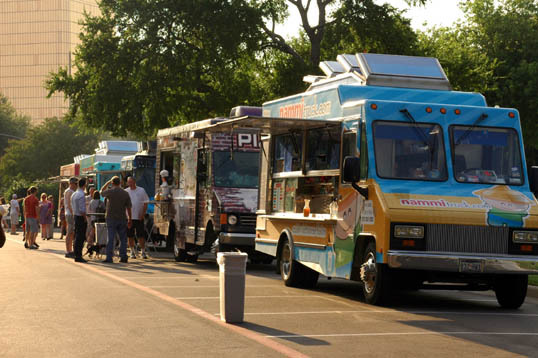 But we live in a world of temptation and I saw publicity for a second Food Truck Festival down in Deep Ellum last Friday. 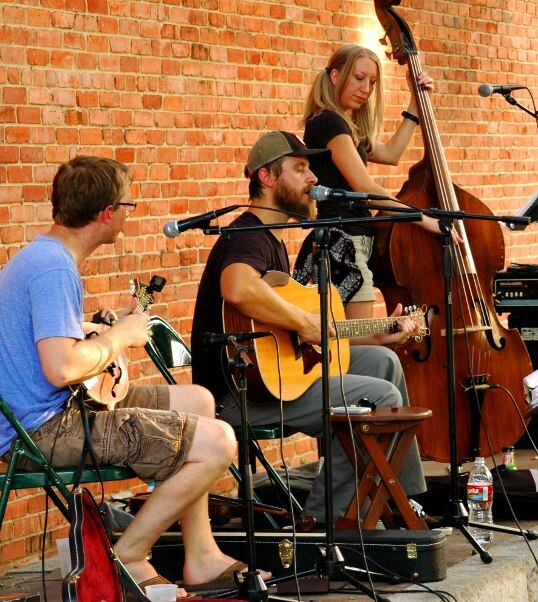 The last one was a big success and Deep Ellum is such a great place for people watching at things like that. I could not resist. So I decided to take the DART train down after work and then simply watch what I ate. Oh, in checking this out, I came across a bit of interesting information. 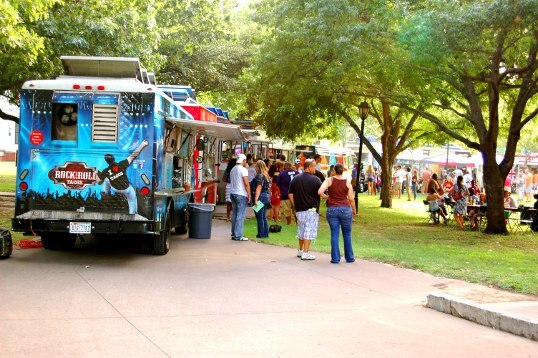 If memory serves, they said a little over a year ago there were two gourmet food trucks in the Dallas Fort Worth Metroplex. Now there are somewhere around sixty four. 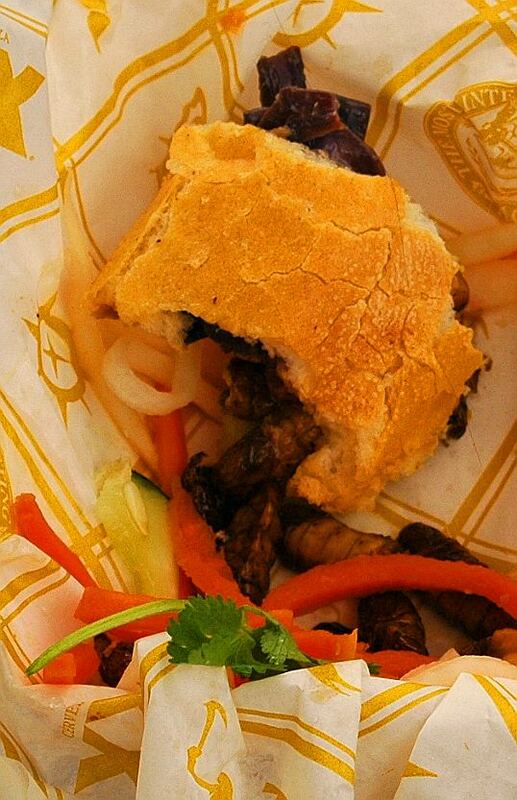 Luckily for me, this festival had a number of healthy options. As is my wont, I chose a truck that I had never tried before. 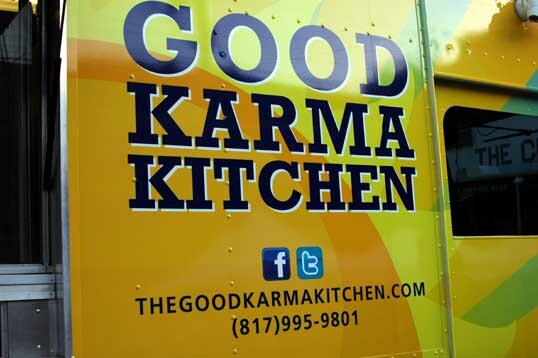 The Good Karma Kitchen truck was in attendance. I don’t think I had even seen this one before – they seem to spend most of their time in Fort Worth. They make gluten-free vegetarian food. Do you think that sounds good? If you do, you are right. In the Northeast quadrant of the city of Dallas, about six miles out from the skyscrapers of Downtown, sits a big ol’ apartment development, The Village. It was always a big part of my life the first decade or so I lived in Texas, though I never lived there. A lot of my friends did and I spent a lot of time hanging out in The Village. When I first moved here The Village was the big Singles Apartment Development. It held about fourteen different apartment complexes with maybe ten thousand residents – almost all of them single. It was when it was still legal to have “adult apartments” that did not allow children. A little pricey for me, I lived a couple of cheaper places in the area and a lot of people I knew had an apartment there at one time or another. The central nexus was The Village Country Club – a complex of pools, tennis courts, athletic fields, with a large clubhouse right in the center of all the action. They would have parties, live music, or sports leagues there, indoors and out. For a wide swath of Dallas young people, it was the place to be. I felt a little above all of that… preferring the more bohemian downbeat parts of town… but looking back it was a lot of fun. I spent a lot more time there than I thought I was and always had a good time. All this came to a screeching halt in 1989 when the federal government made it illegal to refuse children from rental housing. Overnight, The Village became nothing more than another bunch of crappy apartments. I miss it. So I saw on this interweb thing that there were going to be some food trucks down in the Village Country Club parking lot after work. I decided to run down there and grab a bite. I went more out of nostalgia than hunger. It hadn’t changed much – the trees were much larger, the atmosphere more laid back and family friendly, but there were memories stirred up… all of them good. 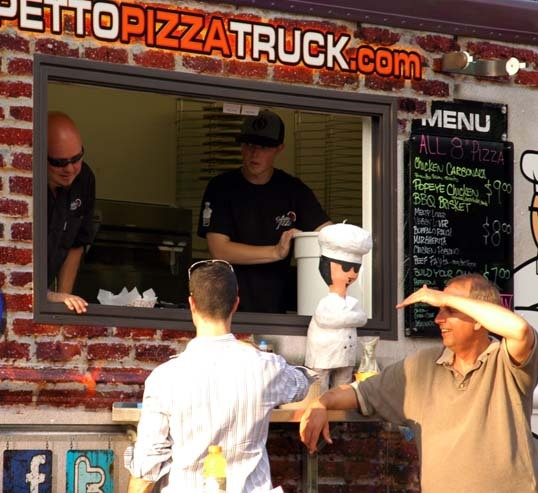 The trucks down there were the usual suspects – but there was a pizza truck I had never been to before, The Gepetto Pizza Truck – so I bought an eight inch pie. It was pretty good – pizza is pizza and always good eats. 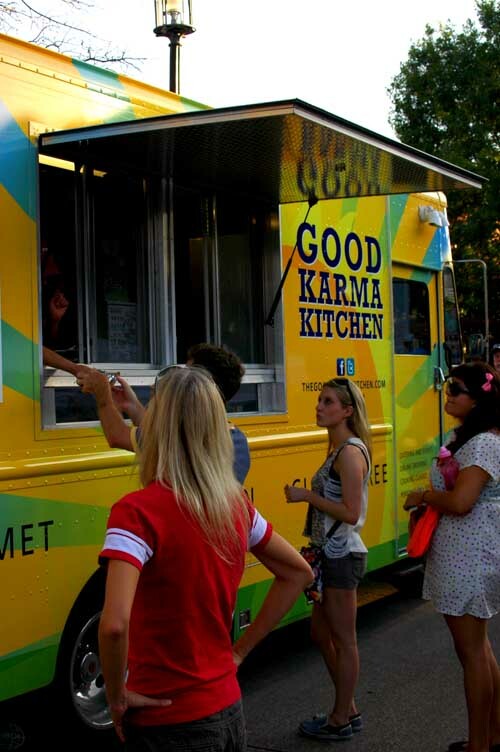 One of the lines of food trucks at the Village Country Club. When you visit a place you haven’t seen in years – it’s always surprising how much the trees have grown. I don’t know if I’ve ever had a pizza I didn’t like. After I ate, I called Candy to see if she wanted me to bring something back for her and she asked about desserts. 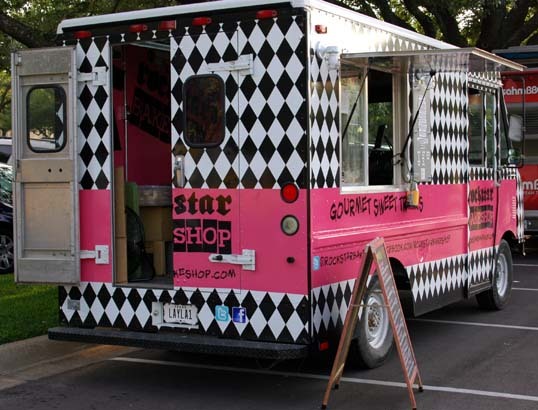 Rockstar Bakeshop was down there with their truck, “Layla”, so I bought her a homemade whoopie pie… and didn’t eat any of it. She said it was good… rich, but good. 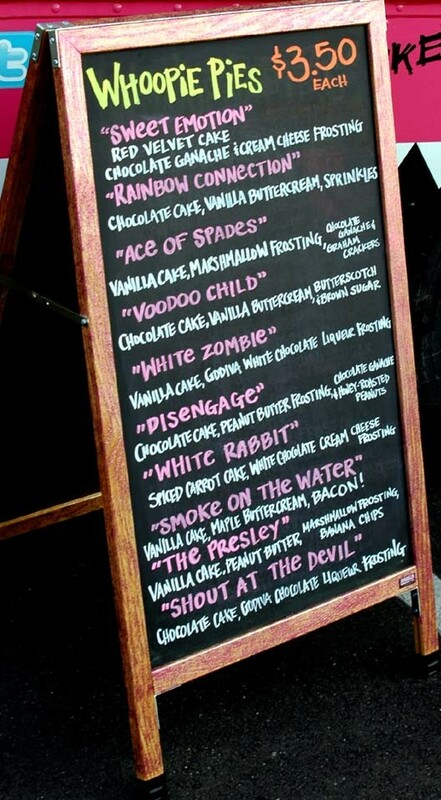 Rockstar Bakeshop always gives its fare fantastic names. 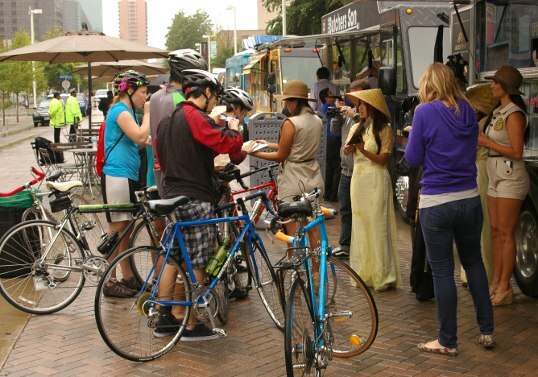 One of the best things about a big food truck fair is that the huge crowds will attract food trucks from other cities. Not surprisingly, some of the best ones drive up from Austin. 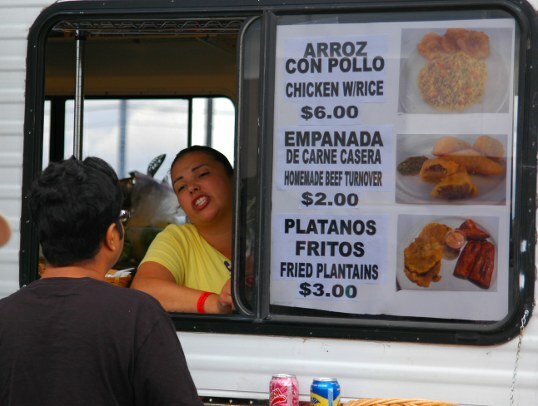 At the last big fair I went to I was walking around looking for trucks I hadn’t tried before, with a special eye out for trucks from other towns, I spotted a food truck that offered Colombian food. 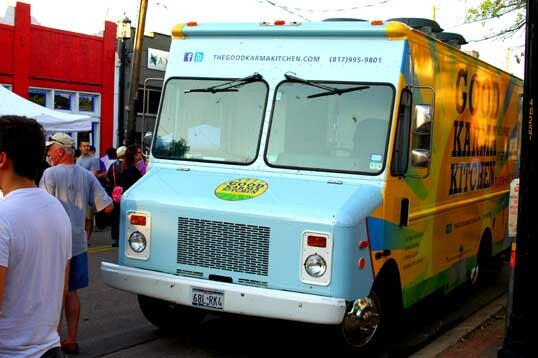 It was called Sabor Colombiano on Wheels and is based in San Antonio. It looked different from the other trucks which are mostly based on large, boxy, UPS-style bodies. This one was a converted RV. There wasn’t much of a line waiting to order, but more like a large clot standing off to the side. 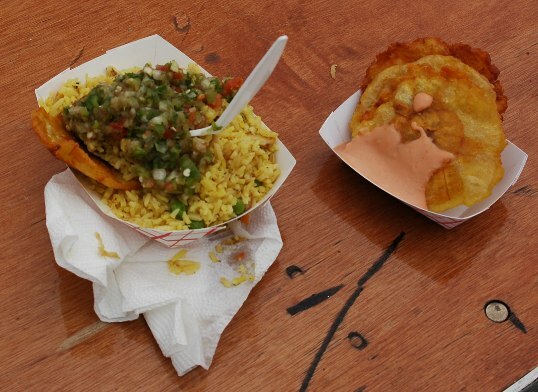 Their menu was simple: Chicken and Rice, Fried Plantains, and Beef Empanadas. I ordered the arroz con pollo with the platanos fritos on the side. They explained that the food came out in big batches and that was why everybody was standing in a group. So I pushed into the crowd and waited. After a while, the orders started coming out. There was a little table with some sort of relish and a pinkish sauce. I have no idea what these were, but I knew I wanted some. When my order came up I pushed the crowd back so I could get to the little table and ladle on plenty of the two mystery sauces. The food was really good. It wasn’t too pimped up or fancy… simply good hearty Colombian peasant fare. I really like the arroz con pollo – it was just right. I’ve eaten a lot of platanos fritos in my day, and everybody makes them differently. These were slices of plantain smashed flat and fried crisp, which was very good. 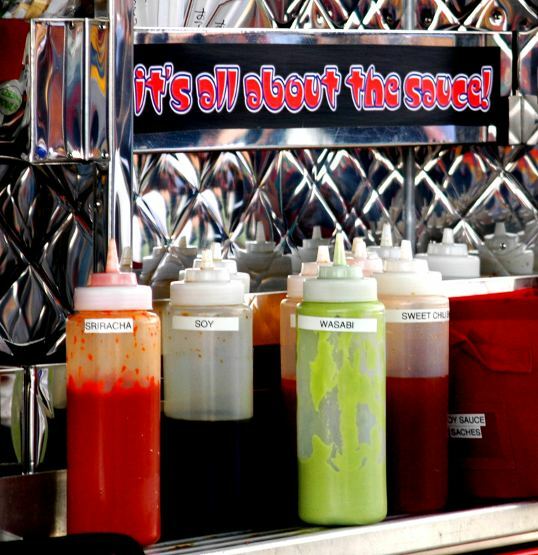 So, if you are in San Antonio and looking for a bite, look up Sabor Colombiano on Wheels on facebook and see where they are at. Oh, and the sauces… I still have no idea. 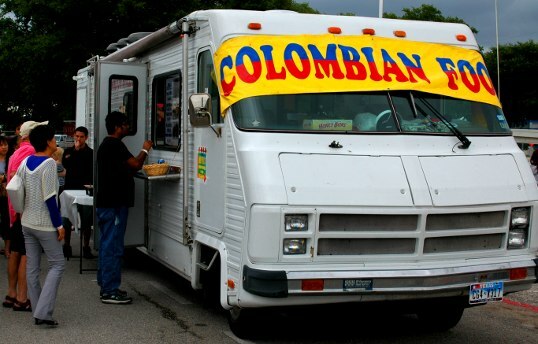 The Colombian Food truck was a converted recreational vehicle. There was a lot going on over the weekend. 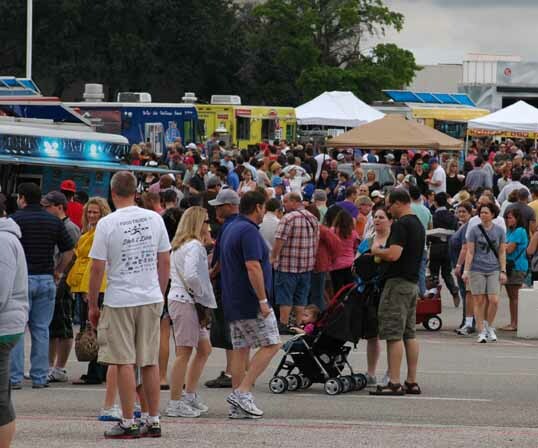 One of the events I had circled on my calendar was a Food Truck Festival in the parking lot at Valley View Mall. It looked like fun. 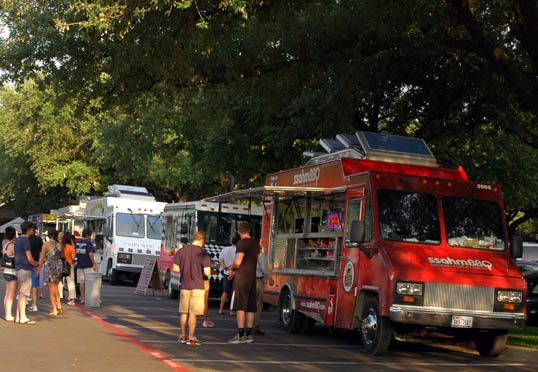 One of the selling points was that they were bringing some trucks in from Austin, a famous Mecca of Gourmet Foodtruckery. After work on Friday, the weather was threatening, light rain and boiling clouds, but Candy and I drove over anyway. We paid the five bucks to get in and I put the wristband on. Now, I knew I’d be careful because I wanted to come back on Saturday and didn’t want to pay another entrance fee. What is it worth to sleep with a Tyvek writstband on? Should I have simply torn the thing off and just handed over another fiver? I’m too cheap so I wore the thing. I haven’t worn a watch for years – ever since I read a news item that said young people didn’t wear watches because they rely on their smart phones. I want to be cool. With a wristband on, I kept unconsciously glancing down at my arm for the time – the old muscle memories of wearing a watch are still there. 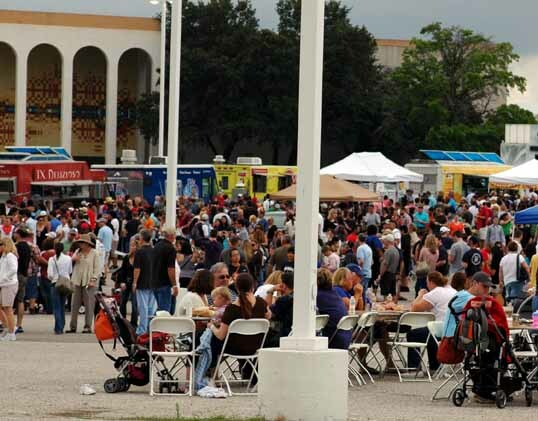 Friday evening at the Food Truck festival had a healthy crowd but not too many. 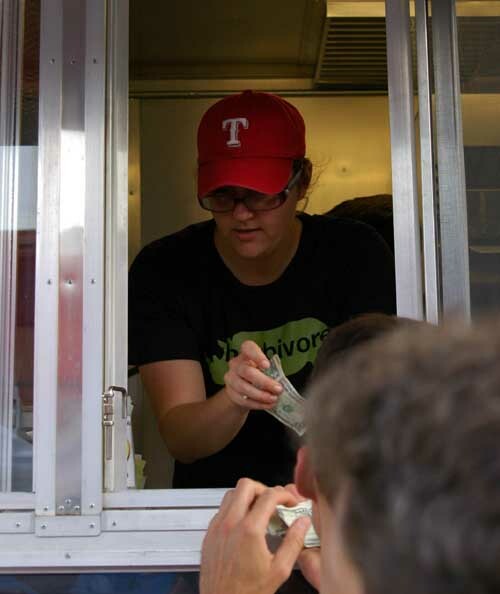 The trucks had small lines – a short wait to order and a couple minutes for your food. Candy and I could sample a few of the many trucks that were there. We had sliders from Easy Slider, which were good, and a pulled pork grilled cheese from Jack’s Chowhound, which I liked better than the Steak Frites I had from them before. We tried two kinds of pizza, a thin crust from TX Delizioso and a thicker one from Doughboy’s Pizza. Candy found some ice cream from Short N’ Sweet and then we headed home – full, but none the worse for wear. On Saturday, Candy was off to New Orleans and I drove down to the Dallas Arboretum to meet with some friends and take some pictures. 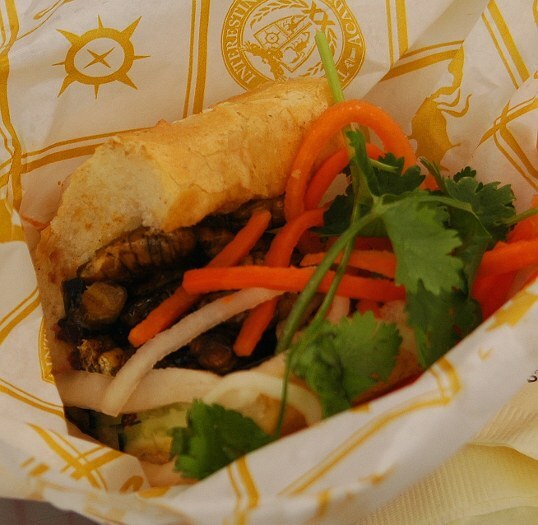 When that was done, I was hungry, so I headed back north to the Festival. The crowd was huge. 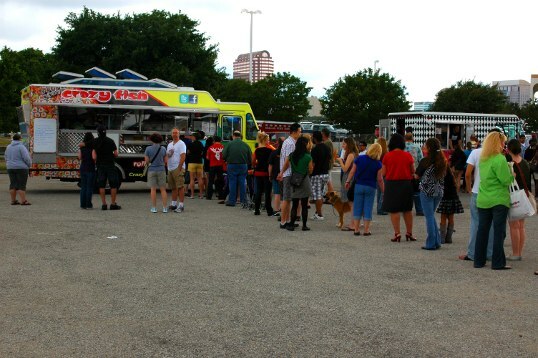 The place was packed and every truck was sporting a long snaking line of food fanatics waiting for their grub. 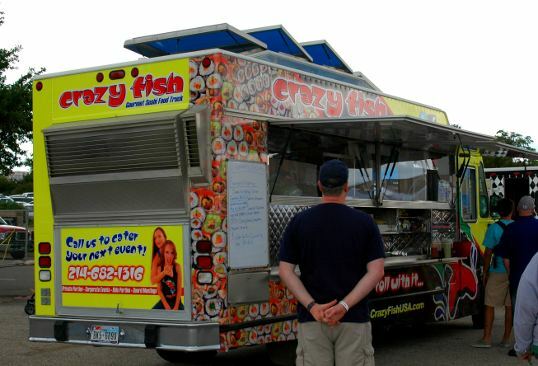 I knew from experience that lines like that mean the trucks were going to start running out of food soon so I jumped in line for the Crazy Fish truck to get some Sushi. I was lucky, right after I placed my order they had to close down… out of rice. I had their last order (though they were able to open up a few hours later). 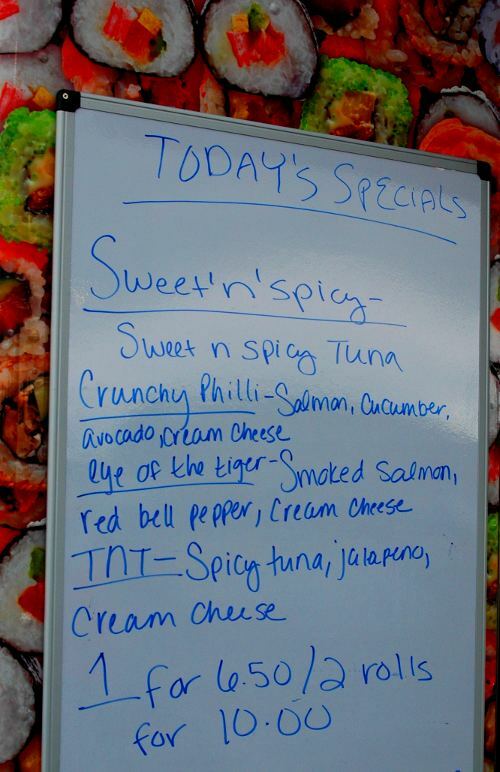 While I was eating (I know sushi from a truck sounds odd – but I will eat anything… and the food was good, I’ll write a review in a day or so) the Three Lions truck pulled in and stopped. A line began to form immediately; before they could open a hundred people were queued up. I looked around for something else I had never tried and found a Colombian food truck from San Antonio and had some Platanos Fritos and Chicken with Rice (review to come). 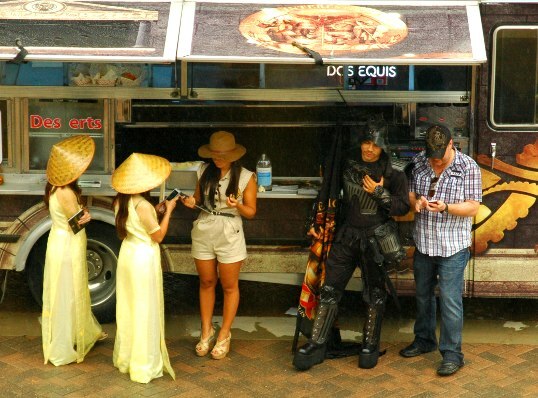 Some friends were supposed to meet me and I called them to warn of the crowds and the trucks running out of food. They said they’d come anyway, but were about an hour out. I was tired and full of food, so I took a little nap in my car, and felt a lot better when my friends arrived. 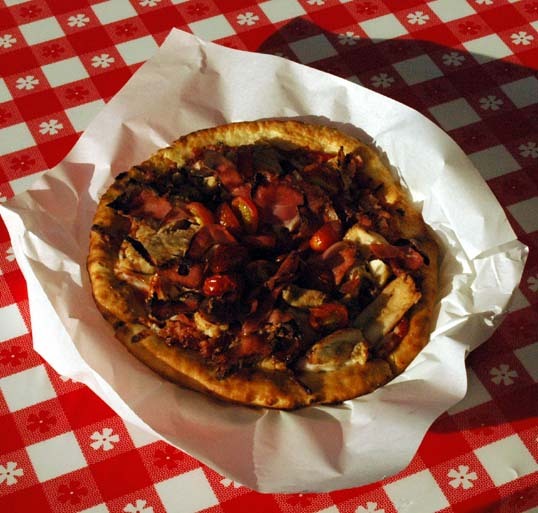 The choices were getting limited – truck after truck was shuttering down, out of food. 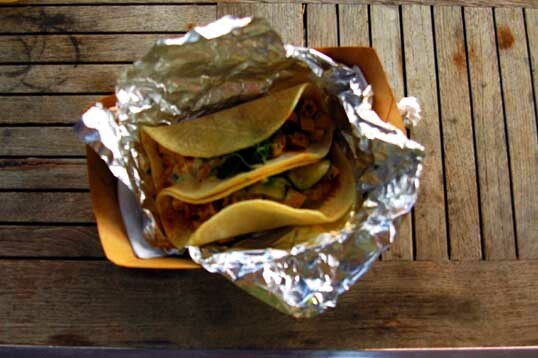 We did manage to score some really good Korean Bar-B-Que Tacos from the Chi’Lantro Truck. The Austin trucks did rock the festival, but Dallas isn’t very far behind. 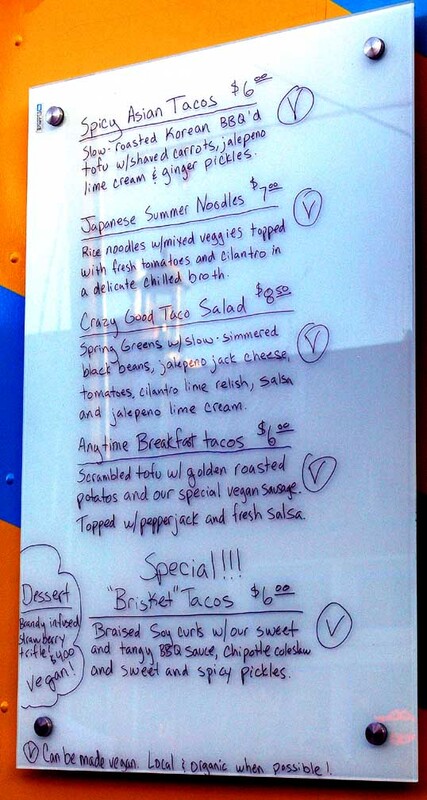 One other truck that we checked out was a new one – the Coolhaus truck, a recent transplant from LA. They had excellent ice cream sandwiches – but I liked their design – pink roof and brushed steel, plus the fact they are named after the architect that designed the Wyly Theater. With this many people willing to pay five dollars apiece simply for the opportunity to wait in line up to an hour to get food out of a truck…. 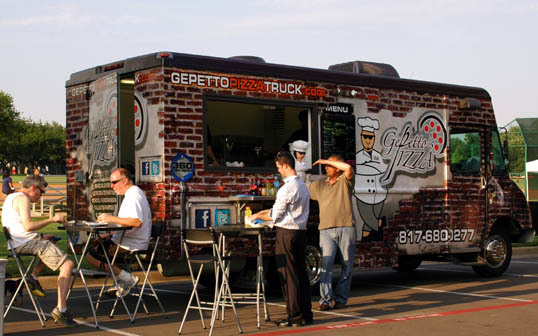 I can’t help but think this gourmet food truck thing still has some legs in Dallas.